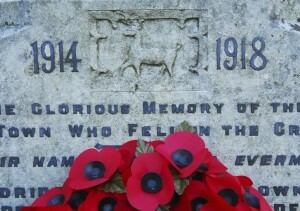 Last week marked the 100th anniversary of the start of World War I (WWI). Also known as the Great War, WWI, which began on July 28, 1914 and lasted until November 11, 1918, was truly the first war of its kind: a global conflict that touched the lives of individuals all over the world. One of the largest and bloodiest wars in world history, WWI helped pave the way for major cultural and political changes across the globe. 100 years later, we sit back and examine the profound effect this war had on the world. The Tower of London has marked the 100th anniversary of WWI with a striking art installation by Paul Cummins. Officially unveiled on August 5th, “Blood Swept Lands and Seas” features thousands of ceramic poppies pouring out of the tower and flowing into the moat below. Each of the 888,246 poppies represents a British military death during the war. The final poppy will be planted on November 11. During WWI, 11 spies were executed at the Tower of London. Nine were executed in the Rifle Range, while the other two were shot in the moat (Tower ditch), while the Range was undergoing work. The men executed at the Tower were taken to the East London Cemetery for burial. After being closed for about six months to set up their ground-breaking new First World War Galleries, “Truth & Memory: British Art of the First World War” and “IWM Contemporary: Mark Neville,” the Imperial War Museum has officially reopened. These galleries give visitors an up-close look at the war from the eyes of those who experienced the conflict firsthand. One of our favorite WWI related sites is Woburn Abbey. We stumbled upon this location when planning a WWI-related tour for a certain university in Texas. Woburn Abbey features a beautifully done exhibition: “Valiant Hearts: World War I – Woburn and its Stories.” This exhibition explores the roles played by people from the Estate and surrounding villages during the war. Valiant Hearts will also explore how the Abbey was converted into one of the most advanced hospitals of the time, treating nearly 2,500 soldiers throughout WWI. The Staffordshire regiment museum, situated alongside Whittington Barracks near Lichfield, tells the story of the Staffordshire Regiment and all its experiences during WWI. The museum houses a collection of around 11,000 items. AESU, the most trusted name in travel, offers unique, exciting travel programs for college students and young professionals at affordable rates. Each trip is action-packed and informal—designed just for people your own age. We are also able to design custom tours just for your group. All you need is a group of 15 or more and we’ll be more than happy to customize a tour to your specifications and interests, like maybe WWI. If you have any questions about WWI Landmarks in England or any of our Affordable European Vacations, please contact AESU by calling 800-638-7640 or fill out the contact form found on our website. And don’t forget to check out all of our great Travel Tips, especially the Travel Tips for Europe, before you head overseas. This entry was posted on Thursday, August 7th, 2014	at 5:27 pm	. You can follow any responses to this entry through the RSS 2.0	feed. Both comments and pings are currently closed.